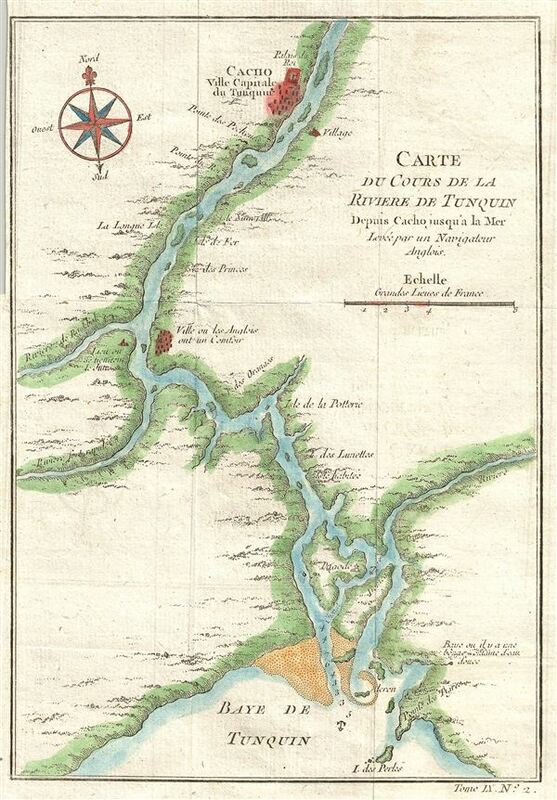 Carte Du Cours De La Riviere De Tonquin Depuis Cacho jusqu'a la Mer, Levee par un Navigateur Anglois. Laden with reddish silt, the Red River, once known as the 'River of Tonkin,' begins in China and forms part of Vietnam's border with China before turning south to pass Hanoi and empty into the Gulf of Tonkin. Both river and gulf derive their nomenclature from the former Kingdom of Tonkin (Tonquin), modern North Vietnam. Though the river floods violently, its delta is an important agricultural area. In the 1700s the country was under the nominal rule of the Le Dynasty, but real power lay in the hands of two warring feudal families, the Trinh Lords of the north, and the Nguyen Lords in the south. Aside from fighting the Trinhs, the Nguyens engaged frequent wars of conquest with the neighboring Khmers and the powerful Siam. With help from their French allies, they were often victorious, winning new lands and titles. However, the desperately poor peasant farmers who formed the majority of the population continued to suffer under the corrupt and oppressive government. Conditions were ripe for a colonialist incursion. In the late 19th century european belief grew that the river offered a lucrative trade route to China. France invaded Vietnam to take control of the Tonkin River, victoriously folding the country into French Indochina in 1886. Drawn by Jacques Nicolas Bellin and published as plate no. 2 in volume 9 of the 1752 French edition of Abbe Provost's L'Histoire Generale des Voyages. Provost, A., L`Histoire Generale des Voyages, 1746-, Vol. IX, plate 2.